Christine Husbands from Red Arc talks about financial advice in later life. We know that the UK population is ageing and life expectancies are longer than ever, terms such as “Care Crisis” indicate the difficulties many elderly people and their families face. 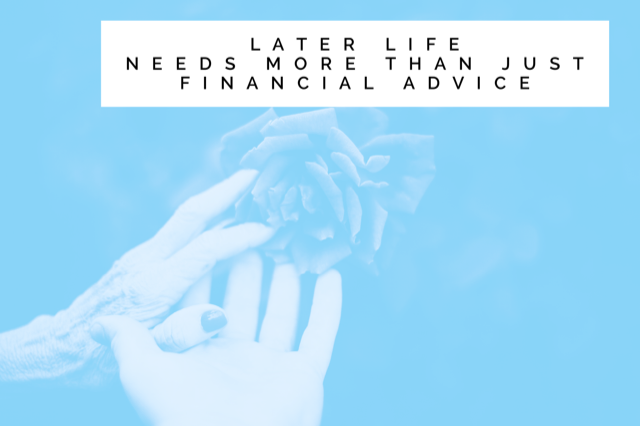 The complexities of financing life beyond retirement, such as pension freedom choices, long-term care funding or inheritance tax planning, all point to an increasing need for specialist financial advice for later life. Unfortunately many people find themselves facing these difficult and complicated issues at times of ill health or bereavement, when there are a multitude of other worries and they are at their most vulnerable. People are often overwhelmed by the situation, fearful for their financial situation, loss of independence, deteriorating health and the effect on their partners and families. Specialist financial advisers provide an excellent service at such a difficult time and being a trusted and empathetic adviser, many find themselves being asked to help with things such as domiciliary care, respite care, accessing medical aids and much more, all of which are outside their remit. Navigating the NHS, social services and other agencies – the UK health system is complex and fragmented, so having an expert to guide you or your family on what is available and how to get it can make a huge difference. Understanding and managing long-term health conditions – with stretched NHS resources, there is often insufficient time to talk through how best to manage conditions, when and who to ask for help. Sourcing appropriate services/equipment – it is important that services and equipment provided is relevant for the individual concerned. An occupational therapist assessment is often important in this process. Helping people to live safely and independently – home adaptations and technology are key enablers to enabling older people to stay in their own homes. Supporting carers and families – people caring can often feel worried, isolated and vulnerable as well as physically exhausted. Help to look after their own physical and mental wellbeing can make the difference between coping and not. Respite breaks and carer support groups can help carers by having a break and connecting with others in similar situations. Preparing for the future – finding the right long-term care is a complex and emotional time for people and their families. Expert guidance is needed to ensure the right place is found as well as sensitive support at such an emotional time. Planning for end of life care can be a huge worry for terminally ill patients and their families who want to make informed decisions and understand what is likely to happen. Bereavement – coping with grief is an extremely long-term and individual process often coupled with lots of practical decisions and implications such as increased caring responsibilities, loneliness and increased vulnerability. Long-term support during bereavement can be a life-line to people, particularly those widowed in later years. Many, if not all of these areas interlink closely with financial advice e.g. state benefits, social services allowances, care funding etc. The protection industry has many added value service providers, between them with expertise in Long-term care, nurse advice, legal help and relevant technology solutions as well as links to many excellent charities such as Age UK, Carers UK along with the many condition specific charities like Dementia UK, Stroke Association, MS Society etc.. If we could bring together the expertise of Later Life Financial Advisers with the expertise of Added-Value Services, together we could make a real difference to the lives of customers in their later years.